The below tutorial helps explain how you can migrate existing VS 2005 Web Site Projects to use the new VS 2005 Web Application Project option. Please make sure that you have already completed Tutorials 1-6 on this site first, as this will help provide you with context about how the VS 2005 Web Application Project model works. Note: If you want to migrate an existing VS 2003 Web Project to use the VS 2005 Web Application Project option, you should read this tutorial here. 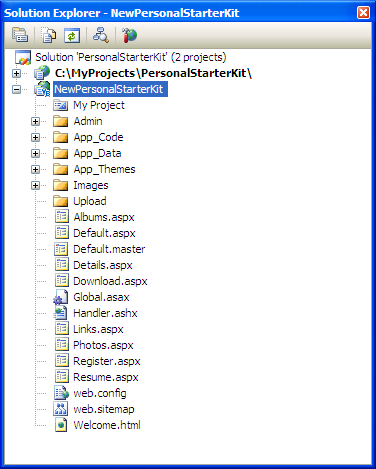 Note: the sample I am using with the migration steps below is the Personal Starter Kit that ships with Visual Studio (if you want to follow along exactly, you can choose File->New Web Site to create the VS 2005 Web Site Project version of it). You can learn more about it and install the released build from here. After installing it, please spend a few minutes following the tutorials on this site to test it out and learn the basics of how it works. The best strategy to migrate an existing VS 2005 Web Site Project is to first create a new blank VS 2005 Web Application Project in a separate directory. This avoids changing any of the existing web site files, and will allow us to copy in already implemented functionality. You can add this new project either to your existing solution (ideal when you have lots of other class library projects that you want to use), or by starting a new instance of Visual Studio and creating a new solution+project within it. 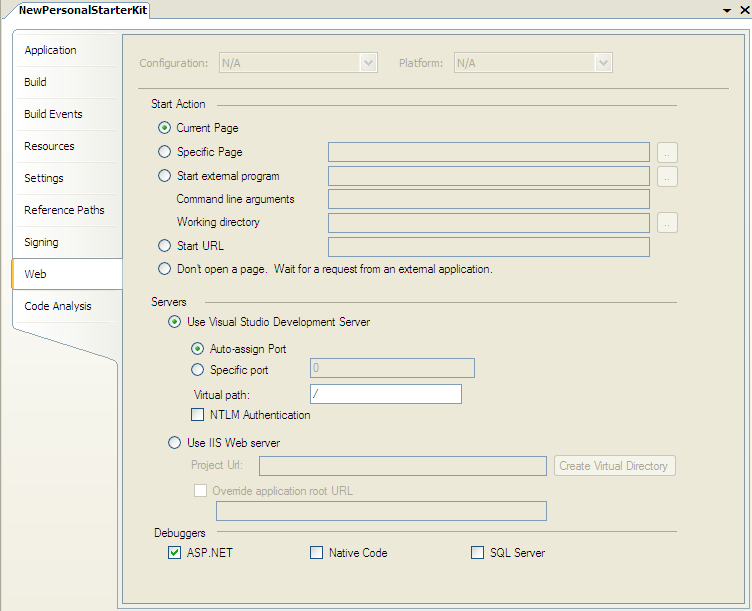 To create a new VS 2005 Web Application Project in a new solution, choose File->New Project and then select the ASP.NET Web Application Project option. If you want to add a VS 2005 Web Application Project to an existing solution right click on the solution node and select Add->New Project. Name the project whatever you want, and select the language type you want to use. Before migrating any code into your new VS 2005 Web Application Project, you should first make sure to setup any project or assembly references for it. 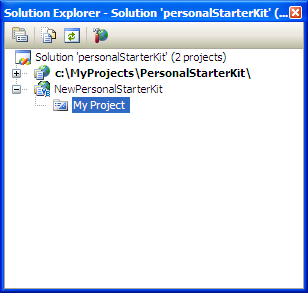 You can see the list of default references with new VS 2005 Web Application Projects by double-clicking on the "My Project" node and selecting the References tab. You can right-click on the Project node to add new References to the project, as well as setup project-to-project references if you have other class library projects part of the solution. Once you have all of your references setup for the project, right click on the project and choose "Build" (or just hit Ctrl-Shift-B). This will build the project and verify that any project to project references are working. 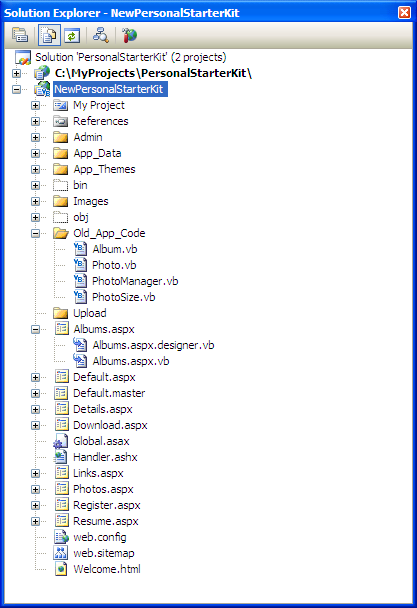 The easiest way to add your existing files from a VS 2005 Web Site Project is simply select all the files in the Web Site Project copy and paste them into the New Web Application Project. At this point none of the files have been converted and the directory structure looks the same as it did in the Web Site Project. 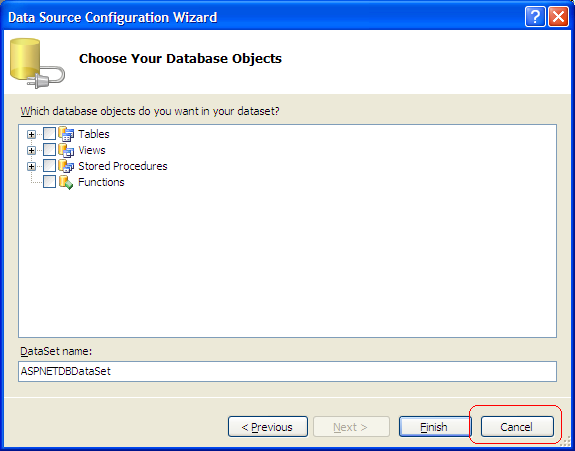 If the Data Source Configuration Wizard is launched during the copy, cancel the dialog and allow the rest of the files to be copied. One difference between a VS 2005 Web Site Project and a VS 2005 Web Application Project is that the VS 2005 Web Site Project Model dynamically generates the tool-generated partial class half of a page, and does not persist it on disk. The VS 2005 Web Application Project model on the other-hand does save this partial class on disk within files that have a .designer.vb extension and compiles it using the in-memory VS compilers when a build occurs (one benefit of this is faster build times). You can learn more about how this code-generation model works by reading this tutorial. Notice how the code-behind files for each page/user-control is still associated with the .aspx, .master and .ascx content. However, no .designer.vb files have been generated. As part of our next step, we will be converting these pages to persist their partial class declarations on disk within a .designer.vb file. After you've added these files, build the project again to see if there are any compile errors. The most likely cause of errors at this stage are: a) You are missing an assembly reference, or b) You are using a dynamically generated type like the "Profile" object or a Typed DataSet. If you are missing an assembly reference, you should go to the reference manager and add it. If you are using a dynamically generated type, please see the Appendix of this tutorial for details on how to use it with the new VS 2005 Web Application Project option. If you have Strongly Typed DataSets under the App_Code directory in your VS 2005 Web Site Project, then you need to make an additional change to fixup the connection string in web.config. Specifically, you need to open each DataSet in the Data Designer and select each TableAdapter and re-set the connectionstring for the object (you can do this by selecting the TableAdapter in the designer and then changing the "ConnectionString" property in the propertygrid). This is supported because with the VS 2005 Web Site Project option Visual Studio is dynamically creating and adding a "ProfileCommon" class named "Profile" into every code-behind instance. VS 2005 Web Application Projects don't automatically support generating a strongly-typed Profile class proxy. However, you can use this free download to automatically keep your own proxy class in sync with the profile configuration.